The fact that you’re reading this means you’re committed to growing and learning about love. Here in ‘Love Box Land’ we’re praying and promoting ways to #Share More Love. Don’t you think it’s time we increase the frequency and intensity of love with our family, friends and communities? You know, LOVE YOUR NEIGHBOR. We believe it’s time to counterbalance fear with faith, peace and love. Mother Theresa said, “What can you do to promote world peace? Go home and love your family.” That’s the place to start. “You must see that there is love at home and at your next-door neighbor’s and in the street you live in, in the town you live in and only then outside. You see, we’re all family – brothers and sisters in God’s family. There are many things we can do to promote peace and love – from random acts of kindness, to getting to know your neighbors to speaking up and one of my favorites whispering or holding our tongue instead of yelling. Love is slow to anger and rich in compassion. 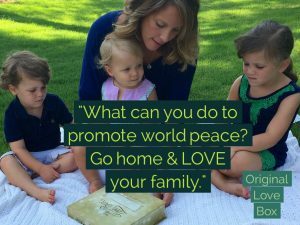 What has helped our family build a foundation of love and celebrate differences is the ‘Original Love Box’ tradition. Before even writing a love note you need to think about the other person and answer these 2 questions. What do you love about the other person? How is the person a gift to you? When you take some time to reflect on these questions and then write love notes, you are creating a precious gift and intimate connection. When you write your feelings down and then speak it to the other person, you’re creating tighter bond. Then when you re-read the notes over and over again, you are multiplying your loving feelings and re-living the loving moments. I pray it continues to heal and build up others. We are humbled that thousands of people have done the tradition so far. Last week we got a shipment of NEW Original Love Boxes. In a limited quantity. You can find out more on the shop page. Let’s be #Love Agents who are on a mission to love others. Bigger. Broader. More. We can do this by loving others with our thoughts, prayers, words and actions. Let’s turn up the heat on Love. Love is the only force that will overcome hatred and ultimately, unite us. I wonder, “How can we build a ‘Love Revolution’ that will sweep across America?” I certainly don’t have all the answers but I would like to talk with you about the question. I would love to hear your thoughts and explore if you would like to align efforts. So the final question and challenge is: What are you doing to GROW love in your family or community? We’re all going to need to pitch in to SEE CHANGE. I KNOW we can do this. This entry was posted in Love Heals, Miscellaneous and tagged family activity, humanity, love, peace on July 12, 2016 by Christine Martinello. How Will You Change Your World? A few weeks ago, I went to a car-racing event with my youngest son and family in Georgia. We sat down on the bleachers and as I looked at the woman sitting to my left, I noticed she had a black handgun in a holster around her waist. Along with her husband and two children under the age of three. Typically, I look at strangers and smile. Not this time. A jolt of fear shot through me. I chose to sit still and wondered. Why? The gun separated us. No one else smiled either. A week later, we heard about the shootings and tragedy in Orlando. So, I decided to DO something. The ‘Love Agents’, my family and I got together and prayed for all those affected in Orlando. Then we wrote love notes for the people injured, relatives and 1st responders. We wrote until our hands ached. My heart was breaking – especially for the mothers. We invited our friends and social media friends to write love notes also. Immediately, the love started flowing in and a few days later we had 232 handwritten, heartfelt love notes! We sent a box overflowing with ‘Original Love Box’ notes along with Love Box books and extra blank notes to Catholic Charities in Orlando. Can’t tell you how good it felt to send some love and light into the darkness. We know the story isn’t over. The battle between good and evil is playing out each and every day. Love will ultimately win. You and I need to help. Are you concerned too? The rise of fear, violence and lack of caring for our neighbors is disturbing. It’s just not right. We know God calls us to ‘Love your neighbor’. We are invited to provide provision, healing and hope in desperate situations. In order to love, we must be compassionate toward our neighbors and understand their pain and plight. Here’s what I know. If each and every one of us DO something, we will see change. Use whatever gifts and talents you have to encourage, connect and uplift others. Maybe it’s by praying or making a meal or music. Maybe it’s by sending a check. Maybe it’s by writing love notes. At times, I feel sad that we live in a culture that exposes us to shootings, death and fear. To me, this is the loss of freedoms for ‘Life, Liberty and the pursuit of happiness’. Sometimes I have hope. I see good people connecting, rising up and doing more. We can build stronger communities filled with peace and love. It’s time to look up from our phones and SEE one another. If we’re going to re-build families and communities, we need to know, care for and provide for one another. Whether it’s making a meal for a sick neighbor, visiting elderly folks, painting an inner city school or writing love notes. So, we are faced with choices. We can cower in fear, panic and refuse to see the needy around us. Or we can stand up together, in faith and service. When my eldest son turned 21 I gave him an engraved watch. It says, “It is time to change the world.” My kids and I definitely feel the pressure to do more good for others. By all means, let’s pray that these violent acts will open our eyes to the evil that exists and be the impetus for loving change. Let’s do something also. Ask yourself the question: “What’s the next LOVING thing I can do?” Then do that. Our children and grandchildren are depending on us. Perhaps you’re already doing much good. I would like to hear how you and your family are ‘Changing the world’ – for the better. This entry was posted in Love Heals and tagged neighbors helping, Orlando. love on June 28, 2016 by Christine Martinello. The terrible tragedy in Orlando has touched us all. The pain and grief is overwhelming. So many of us want to do something but aren’t sure how to help. Here’s one way to send comfort and healing. Let’s surround Orlando with love! The Original Love Box team has decided to take action and send heartfelt ‘Love Notes’ to those impacted. 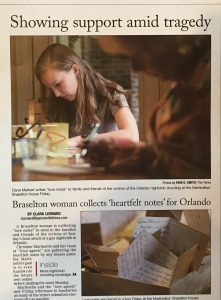 Christine Martinello, creator of the Original Love Box and the ‘Love Agents’ are on a mission to surround Orlando with love. Love notes have flooded in from all over the United States and Prince of Peace Catholic Church has joined the effort. Christine and her ‘Love Agents’ will send the notes on Monday, June 20th. If friends, companies, churches, or community members want to write love notes, they can send them to Christine Martinello. Love has the power to unite us all, whether we’re living near or far. Can we, as a nation, band together to show our love for our neighbors? This entry was posted in Express Love, Love Heals and tagged love, Original Love Box, Orlando on June 16, 2016 by Christine Martinello. Have you ever felt the healing power of love? 1. Love decreases stress. Did you know that love counteracts the fight or flight response? Yes, it does and mighty effectively. Love regulates the production of cortisol (stress hormone) and elevates the production of Oxytocin, (happy hormone), which can reduce cardiovascular stress and improve the immune system. 2. Love causes the production of norepinephrine and dopamine in your brain, which leads to increased feelings of joy and pleasure. 3. Love has been proven to reduce inflammation, improves your immune system, and can be a potent pain reliever. A recent study from the Institute for Behavioral Medicine Research at Ohio State Univ. shows us that people who are lonely develop more reactivation of latent viruses than those that are well connected. 4. Love decreases anxiety and can keep depression at bay. It also reduces the signs and symptoms of heart disease. 5. When you tell another person how much you love them, why and how they are a special gift, you’ll feel ‘love energy’ passing between you both. Love truly is great medicine. Love is a powerful healer in all its’ many forms. When someone says, “I’m so in love” they are often referring to romantic love, but there is so much more to it than that. I want to encourage you to think of love in a broader way. We can grow in love with God, with our children and grandchildren. We can grow more in love with our friends, animals, our self and even grow in love with life itself. When we are united in the Spirit of God’s love and in the service to others we feel an overflowing love. We heal ourself and others when we share the overflowing Spirit of love. So ‘love large’, connect with others and you’ll feel more happy, whole and healthy. The next time you’re feeling low, rather than becoming isolated, call a friend or reach out to someone else with kindness. Don’t underestimate the power of love. Acts of love for people, places and others provide healing health benefits. Try it, I think you’re going to not just like it, you’ll love it! Question for you: How will you share the healing power of love? This entry was posted in Love Heals, Miscellaneous and tagged body, christian, grandmom, heal with love, healing, health, love, mind, mom, power of love, spirit, tradition on October 8, 2015 by Christine Martinello. As Kim says, “I’m finding people are walking around and not feeling very appreciated or loved whether it’s with our kids or in our families or at work.” Like cracked glass, we can feel broken at times. We want to be put back together again and feel whole. We can heal our relationships and Kim shows us the way. This video highlights Kim’s brave story. She shared words of affirmation and appreciation with not one or two but twelve people in her extended family! Can you imagine? Kim stepped out in unconditional love because she felt strongly about helping each person in her immediate and extended family ‘find their voice’. Look at how Kim lights up as she describes how everyone reacted to her and everyone become closer. If you or anyone you know comes from a family that felt broken, you know what a courageous story this is. Here’s to stopping the cycle of chaos and sharing unconditional love. Thank you Kim for your courageous efforts to be the ‘linchpin of love’ in your family. What have you done to create healthy and whole relationships? This entry was posted in Love Heals and tagged christmas, family activity, family love, grandmom, healing, health, love, mom, spirit, tradition christian on October 5, 2015 by Christine Martinello.